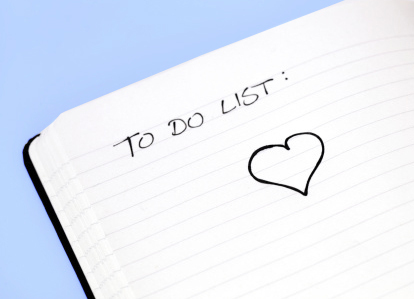 What's on Your "Love To Do" List for This Year? You probably already have some kind of To Do list, but perhaps what you really need at the beginning of this new year is a “Love To Do” List. When you combine your unique interests and passions with knowledge of your character strengths, you will find that you have many powerful ways to bring purpose, energy, and joy into your own life while also making a meaningful contribution to the world around you. You can start off by using the free, scientifically-validated VIA Survey to help you identity your highest strengths out of a list of 24 character strengths that are valued in almost every culture. Your highest strengths are the ones that come most naturally to you and are a core part of your identity. These VIA strengths include qualities such as: Love, Forgiveness, Leadership, Humor, Bravery, Curiosity, and Creativity. There are youth and adult versions of the VIA Survey in multiple languages making it an excellent tool for individual use, as well as for use in families, schools, workplaces, and organizations of all kinds. Once you have taken the VIA Survey and have read through your results, go back through them and ask yourself this question about each one of your Top 5 to 7 strengths: How do the things I most enjoy doing allow me to express this particular character strength? For instance, your love of reading could possibly reflect your strengths of Curiosity or Love of Learning. Your love of playing team sports might be an expression of your character strengths of Teamwork, Zest, or evenBravery. The same activity that provides one person with an opportunity to express their strength of Kindness might inspire the strength of Appreciation of Beauty & Excellence in someone else. Discovering new books and ideas and researching anything that I am curious about….like strengths, for instance! Coming up with fun ways to teach people how to understand and use their own strengths! When I look at the items on my “Love-To-Do” list, not only do I see all my highest strengths shining through bright and clear, but I also see a powerful collection of ways that I can be really helpful to others simply by doing some of the things I really enjoy. I might not be good at everything (and seriously, name one person who is…), but I can really shine when you need someone to help build relationships in a community…or to come up with a fun, creative way to accomplish a goal…or to help people feel energized and hopeful about collaborating and working together. It’s absolutely okay if you are not good at or even interested in any of the things on my Love-To-Do List. You have strengths and talents in some areas where I really struggle to perform well…and that is exactly why we need each other. There is always something that you love to do that someone in the world struggles with or could really use some help getting done. Always. So my hope for you this year is that you will take the good Rev. Dr. Thurman’s words of wisdom to heart and come alive with your character strengths today. Start by creating and following through on your own “Love To Do” List. You could use the joy and energy…and the world sure could use your strengths!